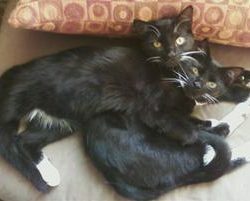 Tango and Waltz are two sweet, very attached brothers. They have been together their whole lives and must stay together. These two boys have a condition called obstructed cardiomyopathy and need a medication twice a day. “The Twins”, as their foster mom calls them, are very sweet and playful but due to their heart conditions are unlikely to find an adoptive home.